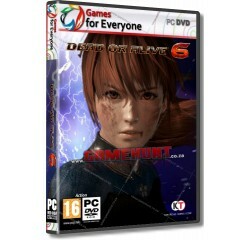 Dead or Alive 6 - R180,00 : Game Hunt, Where we lead, others follow. [Story] - The story will follow the events of DEAD OR ALIVE 5, focusing on 2 separate main narratives; namely, the battle between "Ninja and DOATEC" versus "M.I.S.T. lead by Donovan", and the events that occur during the 6th DEAD OR ALIVE Tournament. New side story episodes will also be added for returning characters. [The New Visuals] - With the help of a new graphics engine, DOA6 aims to bring visual entertainment of fighting games to an entirely new level. The graphics are made to be both enticingly beautiful and realistic, bringing out enhanced facial expressions, such special effects as depiction of sweat and dirt on character models, and realistic hit effects. [The Triangle System] - Following the tradition, fights in DEAD OR ALIVE 6 are based on a triangle system: strikes beat throws, throws beat holds, and holds beat strikes. Landing a well-timed attack of the type that beats your opponent's attack, like landing a strike when an opponent tries to throw, will result in a Hi Counter attack and do more damage. [New Combat Mechanics - Break System] - In this new title, we are introducing a new Special Move Gauge (Break Gauge) to the DEAD OR ALIVE series, adding a new dramatic strategic element to the fights. This element is made to be accessible and easy to use even for people who are new to the world of fighting games, and is activated by simply pressing the [RB] button. [Break Blow] - A strong, high-damage special move that knocks your opponents down. The first part of the move also parries incoming attacks, working as both an offensive and defensive move! [Break Hold] - A convenient counter technique that can also be used while the player is heavily stunned. It should only be used in tight situations due to its light-damage output. [Fatal Rush] - A powerful combo with a dramatic finishing move, activated by consecutively pressing the [RB] button. While it is made to be easy to use for beginner players, it can also be employed in more than one creative way by the experienced competitors. [New Danger Zones] - If knocked into onlookers, they will push the player back into the center of the stage. It is a trap that combines the atmosphere of a real street fight with strategy. [Mass-Destruction] - If the opponent is knocked back into a large stack of boxes or barrels with "Break Blow" or "Fatal Rush" it will cause a large chain-explosion. This will lead to a huge burst of damage and produces an exhilarating rush. Processor - Intel Core i5-4690 or better® or equivalent AMD® processor.